Canadian small cents are great coins to collect because they represent a relatively affordable series yet still offer many challenges for even the most seasoned of coin hobbyists. While Canada introduced its one-cent coin in 1858, the denomination was originally struck as a so-called "large" cent, similar to the half-dollar-size U.S. large cents and broad British pennies of yesteryear. 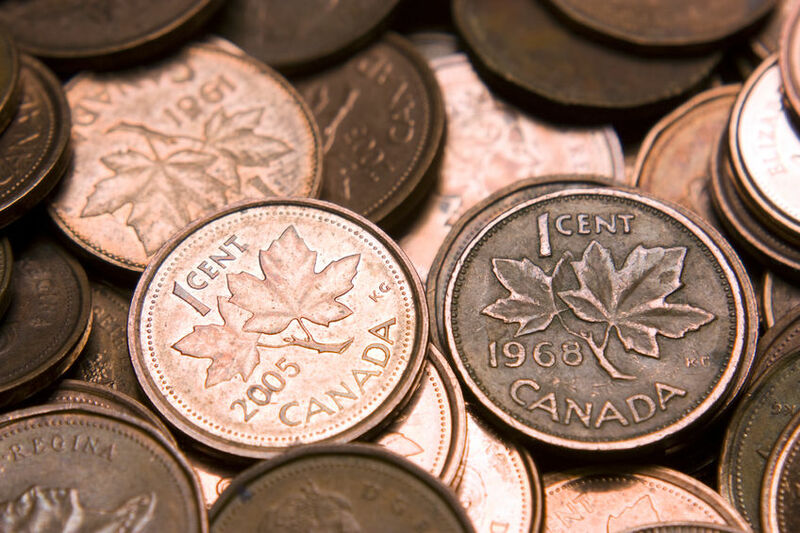 Canada reduced the size of its one-cent coins in 1920 from 25.5 millimeters in diameter to 19.1 millimeters and continued striking pennies until 2013, when the nation eliminated that denomination. Canadian small cents were made with two distinct reverse designs and saw three different reigning monarchs; Queen Elizabeth II alone had four different obverse portraits on the Canada cent. Additionally, there were a few commemorative designs and an array of die varieties. This adds up to several interesting elements to help keep coin collectors on their toes. How Much Are Canadian Pennies Worth? *Values are for coins in average circulated condition and are worth more in better grades and less if well worn, cleaned, or damaged. Those who are collecting Canadian pennies from pocket change may choose to store their coins in cardboard folders, which is perfectly sufficient for circulated common-date pieces. Hobbyists who endeavor upon collecting uncirculated and/or proof coins or wish to acquire scarcer Canadian pennies might be prudent in selecting more protective (though more expensive) coin albums. Several manufacturers offer coin folders and albums for Canadian pennies, including Whitman, Dansco, and H.E. Harris. Because the Canadian Mint no longer makes pennies, the overall range of Canada's small cents is closed – meaning there is a defined starting point (1920) and ending point (2013). For this reason, many people simply collect all Canadian small cents from 1920 through 2013. Still, there are coin collectors who will focus on a specific reigning monarch, such as George V or Queen Elizabeth II. Within the Queen Elizabeth II Canadian pennies alone, there are at least four well-defined short sets, all based around the four different obverse portraits of the Queen. Some coin collectors even go one step further in defining their Canadian penny short sets, focusing on just the various "straps" or "without straps" design modifications of 1953 through 1955 or the die varieties concerning the rim border beads and variations on the date digit "5" among the 1965 Canadian pennies. Indeed, the possibilities for collecting Canadian small cents are virtually endless! Limited Mintage Stardust Silver Terminator Round!